Les Meredith was well known in the small community of Camarillo as a person who liked to help others. He was well suited in his career as a teacher and concurrent Vice Principal at the local intermediate school, Los Altos. He also had a reputation for being a top-notch diver. He fondly recalls his college years, when money was tight, diving kept food on the table for him and his family. "We ate more abalone than anything else back then." Growing up in Santa Monica, Les learned to swim in the ocean when he was seven and soon began body surfing in the waves. In 1949 he bought a set of Churchill fins and a mask for $10 and took up free diving off the Santa Monica pier and the Palos Verde peninsula. 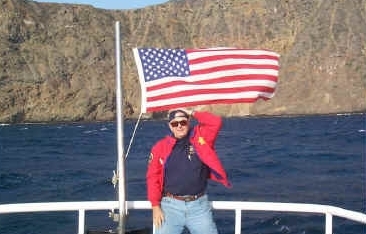 Les was introduced to scuba diving in 1956 by a college buddy and has been an active diver ever since. 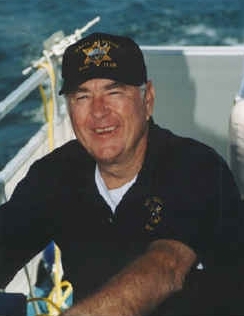 When Senior Deputy Terry Roth of the Ventura County Sheriff's department started recruiting divers in 1966 to form an underwater search and rescue team, Les' name was at the top of his list. Roth, who had not yet met Les, visited him one day at the school where he taught. To break the ice, Deputy Roth joked to Les about being there to see him about some unpaid parking tickets. After joking around about the fictional tickets, Roth described his plan to form an underwater SAR team to Les and asked him to be a part of that team. Les was immediately attracted to the idea. He was intrigued by the thought that he could use his watermanship skills to further contribute to his community. He wholeheartedly agreed with the deputy's plan and became one of the charter members of the Ventura County Sheriff's Underwater Search and Rescue Team. One of Les' first official acts was to recruit his long-time friend and dive buddy, Dave Arlander to help start off the team. With nine members, and several months of training behind them, the team was officially launched in 1967. Les went on to further his training by enrolling in a PADI scuba instructor course. He excelled in this course by drawing from his background as a professional photographer in the United States Air Force, and from his years of experience teaching oceanography classes at Los Altos. Les received a wonderful complement as a teacher during this instructor program. "I was giving a presentation on oceanography, so I used the slide show I had made for school. After I finished [the presentation], the instructor who was critiquing said he got so interested in my presentation that he forgot to take notes." With the exception of a 2-year hiatus in the late 1970s that he took to complete a Masters Degree in education/administration, Les has been a steadfast member of the dive team. He tells how he has enjoyed collaborating with team members to develop and refine search equipment and procedures into what they are today. Volunteer team members often have other responsibilities that may hinder their ability to respond to every call-out, but seldom has Les ever not responded to a critical situation. Les always feels deeply for the family who has lost a loved one. He said he would quit the team if he ever got to the point where he felt nothing on a recovery. He is hit the hardest when a search results in finding a child that has drowned. You can see the toll it takes on his face when he recalls the time a 6-year-old was lost in a lake, or when he talked about the 16-year-old who was found in a quarry after ditching school on a hot summer day. What keeps him going is knowing that he is helping people put closure on a painful part of their lives. That he is there to make this emotionally draining experience as easy as possible for the surviving family members. With 26 years as an educator who taught all subjects while at the same time served as a school administrator, Les has enjoyed a rewarding career. Les chose teaching at the junior high level because he liked working with kids, and said, looking back, he realizes that was a time in his life when he needed the most help. To him, there was no question as to where he would best be able to add a positive influence on young people's lives. His choice was validated one day, when he ran into a former student at a gas station who came up to him and said, "I want to thank you Mr. Meredith." When Les asked what he was thanking him for, he replied, "If it wasn't for you, I'd be in jail right now. I know that." "What did I do," questioned Les, "You were there when I needed somebody. You listened." These days, Les is taking advice from another former student, a boy from his seventh grade shop class, who is now grown and a member, alongside Les, of the Rotary Club. This younger cohort has been encouraging Les to run for City Counsel for some time. After giving the decision lots of thought, Les has agreed to run for the position. He states his inspiration to do so comes from the same reason he went into the field of education and volunteering for the dive team, "it gives you satisfaction you can't buy." Another source of satisfaction in Les' life has come from being a volunteer on the Planning Commission. He has been working on the Planning Commission for a total of 20 years. As part of the commission, he enjoys helping the community see its' way to a positive, productive future. Les has since retired from the school district and in his spare time in between his volunteer work, he sells real estate for Fred Sands in Camarillo. He has been married to his wife, Melinda for 25 years. Melinda is a first grade teacher at Manzanita Elementary school. They have three children, Jon, Laurie and Brett, and two grandsons, Geoffrey and Davey.